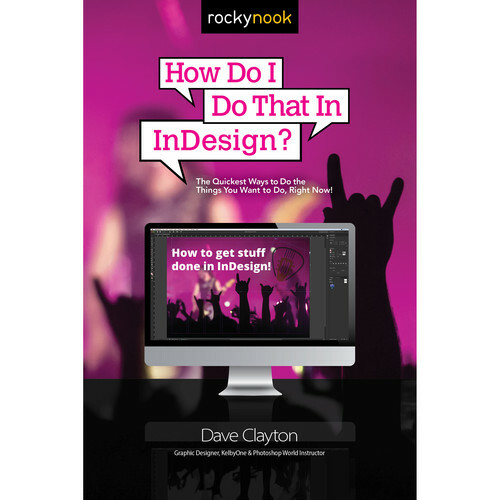 Dave Clayton How Do I Do That in Indesign? How Do I Do That in Indesign? from Rocky Nook gets you fast answers to your questions about how to do things in Adobe InDesign. The software of choice for desktop publishing and typesetting, this program lets you create professional, eye-catching posters, flyers, brochures, magazines, newspapers, presentations, books, and e-books. Created by designer and author Dave Clayton, this book shows you all the power and depth of InDesign, and teaches you how to take advantage of the hidden and not-so-obvious tools and features of this professional program. Becoming proficient and mastering professional editing programs is not easy, and it takes time and effort. That's where this book comes into play, and that's why this book was created, to quickly get you the technique, the shortcut, the setting, or the tool you need to create the effect you are looking for. This isn't a book full of theory, confusing jargon, or multi-step concepts. Instead it is a straightforward book that tells you which button to click and what setting to use so you're never stuck in InDesign again. When you need to know how to achieve a particular result just turn to the page where Dave tells you the steps to get it. Written in a casual and easy-to-follow style, this book expertly guides you to a place where you are quickly editing your images the way you want. It will likely become your go-to book for everything InDesign.